Kashkaval is a type of yellow cheese made of cow milk (kashkaval vitosha), sheep milk (kashkaval balkan), or both (kashkaval preslav). The name is derived from the Italian caciocavallo (Romanian: cașcaval, Bulgarian: кашкавал, pronounced [kɐʃkɐˈvɑɫ], Macedonian: кашкавал, pronounced [kaʃkaˈval]; Turkish: kaşkaval/kaşar, Serbian: качкаваљ or kačkavalj; Albanian: Kaçkavalli). In Albania, Bulgaria, Republic of Macedonia, Serbia and Romania, the term is often used to refer to all yellow cheeses (or even any cheese other than sirene). In English-language menus in Bulgaria, "кашкавал" is translated as "yellow cheese" (whereas sirene is usually translated as "white cheese" or simply "cheese"). The name kashkaval comes from Latin caseus (cheese) and caballus (horse). According this theory for the Italian name caciocavallo, the widely accepted explanation of the word "cavallo" (horse in English) comes from the cheese being traditionally dried by attaching two gourd shaped balls of caciocavallo with a single rope and hanging them to a wooden pole as if placed on a horse's back. Another theory exists. Some researchers from the Faculty of Veterinary Medecine in Belgrade claim the Aromanian population, a native Balkan people (pejoratively Tzintars in Greek usage), created cașcaval. As in Romanian, the word caș means in Aromanian (Tzintar) language cheese. No etymology is given for the suffix -kaval in the word kachkaval in the study, nor do the researchers mention the horse, the Latin term caballus or even the Italian term cavallo and instead refer to the seasonal movement of the semi nomadic Aromanians and their livestock between fixed summer and winter pastures (transhumance). In Bulgaria, Kashkaval (written as "кашкавал" in Bulgarian) is made from cow's milk and is known as Kashkaval "Vitosha" while a variation made from ewe's milk is called Kashkaval "Balkan". Kashkaval "Preslav" is the name given to the cheese made from a mixture of both milks. Kashkaval is a traditional food used in most of the breakfast pastry. One of the most common dishes with kashkaval is kashkavalka which is a little pastry containing kashkaval inside and on top. Like in the other Balkan countries, it is a major substitute for all other kinds of cheese, especially in pizzas. Another popular Bulgarian snack is Princess (Bulgarian: принцеса) which is a grilled slice of bread topped with kashkaval or topped with ground pork meat and kashkaval. In Lebanon and Syria, this type of cheese is also called kashkawan (Arabic: قشقوان‎‎). It is very popular and is generally imported from countries such as Bulgaria and Hungary or manufactured domestically; it is sometimes used as a topping for manakish. In Romania, cașcaval (Romanian pronunciation: [kaʃkaˈval]) is used to refer to a number of types of yellow medium and semi hard cheeses made of sheep's or cow's-milk. The term is often used by extension as a generic name for all semi-hard yellow cheeses such as the Swiss Emmental cheese, the Dutch Gouda and the British Cheddar, or anything that looks similar to cașcaval. During the communist regime, because of the food shortages, Romanian housewives developed a technique for a homemade pressed cheese, similar to cașcaval, made out of milk, smântână, butter and eggs. In Romanian cuisine, a lot of dishes are made with cașcaval, like caşcaval pane or mămăligă cu brânză. In Serbia, kačkavalj is traditionally a sheep milk hard cheese, and as such a protected brand of the city of Pirot. Other cheeses, made from a mix of cow and sheep milk, are sometimes also branded as kačkavalj but they cannot be defined as pirotski (of Pirot). 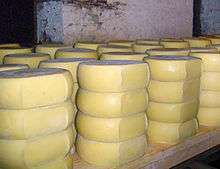 Kačkavalj is one of the six traditional cheeses of Serbia. The production process (in Serbian) can be seen online, and according to a TV show video clip, it was brought to Pirot in the 1810s with the Dalmatian or Italian cheesemakers who settled in then-Ottoman Empire; the cheese was distributed throughout the Balkans (specifically mentioned in the link are Salonica and Istanbul). Wikimedia Commons has media related to Kashkaval.